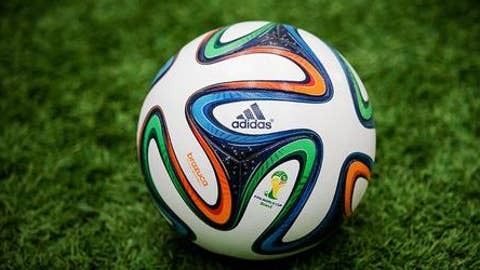 World Cup supplier adidas officially unveiled the ball for next summer’s extravaganza in an event at Parque Lage in Rio de Janeiro on Tuesday. The brazuca is different from any other previous World Cup ball in several ways. What you notice right away is that it consists of only six polyurethane panels, down from the Jabulaniâs eight panels. This follows adidas’ trend of reducing the number of seams on their balls; adidas’ first World Cup balls consisted of thirty-two panels. The six thermal-bonded panels are irregularly shaped, almost propeller-like, and are meant to produce faster flight speed, a more stable flight path and maintain true roundness. This should be music to the ears of goalkeepers and players who lambasted the Jabulani for its unpredictable flight path. The surface texture of the ball is also new. The Jabulani was the first ball that featured tiny, raised nubs to improve traction and control in all weather conditions. The Brazuca also features these, but are round like on a basketball. The Jabulani’s nubs were more rectangular in shape. Weâre not sophisticated enough to understand why, or even if, that makes much of a difference, though. Then thereâs the name itself, of course. For the first time ever, adidas let fans of the World Cup host nation name the ball. Millions of Brazilians turned out to vote, with âbrazuca,â an informal word used by Brazilians to describe national pride, taking 77.8% of the vote. âBossa Novaâ was a distant second in the voting. When adidas hosted media outlets at its World Cup kickoff event last month, we learned that their innovation lab already started developing the ball three years ago, and began testing the prototype just six months later. The brazuca thus became adidasâ most tested ball ever, with over 600 players involved throughout the process. The ball was also secretly tested at this year’s Under-20 World Cup.Sheâs beautiful, isn’t she? When adidas hosted media outlets at its World Cup kickoff event last month, we learned that their innovation lab already started developing the ball three years ago, and began testing the prototype just six months later. The brazuca thus became adidasâ most tested ball ever, with over 600 players involved throughout the process. The ball was also secretly tested at this year’s Under-20 World Cup.